Anthurium hebetatum Croat, sp. nov. TYPE: Panama. Code: La Mesa, above El Valle de Ant6n, ca. 2 km W of Cerro Pilon on slopes of steep hill, 860-900 m, disturbed virgin forest, Croat 37415 (MO 2395376, holotype; CM, F, PMA, US, isotypes; Live at MO). Planta epiphytica; calaphyllum subcoriaceum, fragile, persistens plus minusve intactum, denique deciduum; petiolus leviter camplanatus ad leviter sulcatus, interdum 1-2-costatus; lamina coriacea, oblonga ad oblongo-elliptica aut oblongo-ovata, basi leviter cordata, (25-)39-85 cm longa, (6-)9-18.5 cm tata; inflorescentia effusa; pedunculus 11-32 cm longus, teres; spatha subcoriacea, pallide viridis, margine rubro-purpurea, lanceolata, plerumque fragilis, 5-12.5 cm longa, 1.5-2.2 cm lata; spadix viridis, 6-12.5 cm longus; baccae purpureae, obovoido-ellipsoideae, ca. 6 mm lon-gae. Epiphyte; stems 20 cm or more long, 1.5-3 cm diam. ; internodes 1-2 cm long; leaf scars 1-1.5 cm wide; roots green to brownish, ca. 5 mm diam., smooth, descending; cataphylls subcoriaceous, brittle, 13-18.5 cm long, tinged violet, the epidermis cracking, acuminate at apex, held around petiole, drying tan, persisting more or less intact, ultimately deciduous. LEAVES spreading to pendent; petioles 10-44 cm long, 7-9 mm diam., weakly flattened to shallowly and sharply sulcate adaxially, sometimes faintly 1-2-ribbed abaxially, the epidermis turning gray to tan and cracking; geniculum 2-4 cm long; blades coriaceous, oblong to oblong-elliptic or oblong-ovate, acuminate at apex, rounded to shallowly lobed at base, (25-)39-85 cm long, (6-)9-18.5 cm wide, broadest near middle or just below; anterior lobe 38-81 cm long, the margins straight to weakly convex; posterior lobes 1-5.5 cm long (from apex of sinus to outermost point); sinus parabolic to hippocrepiform or sometimes spathulate; the surface matte, midrib acutely raised above, diminishing toward apex, convexly raised below; basal veins 3-5 pairs, usually free to the base, flat to prominulous above and below; primary lateral veins 12-20 or more per side, departing midrib at 30-35¡ angle, weakly sunken above, flat to prominulous below, interprimary veins flat above and below, lesser veins obscure; collective vein arising from the first basal vein, sunken above, prominulous below, 3-5 mm from margin. INFLORESCENCE spreading, shorter than leaves; peduncle 11-32 cm long, 5-9 mm diam., terete, one-third to one-half longer than petioles; spathe subcoriaceous, pale green, tinged red-violet at edges, lanceolate, usually brittle, 5-12.5 cm long, 1.5-2.2 cm wide, broadest at middle or below, acuminate at apex, rounded to acute at base, the margins weakly turned up, thin and cracking; spadix medium green (B & K Yellow-green 6/7.5), slightly tapered toward apex, 6-21.5 cm long, 5-11 mm diam. near base, 4-7 mm diam. near apex; flowers square to 4-lobed, 2.2-3.2 mm long, 2-2.7 mm wide, the sides sigmoid, 7-9 flowers visible in the principal spiral, 5-7 flowers visible in the alternate spiral; tepals semiglossy, minutely papillate, lateral tepals 0.7-1.9 mm wide, the inner margins straight and flat; pistils scarcely emergent, pale greenish white; stigma ca. 0.4 mm long; lateral stamens emerging nearly to apex of spadix before third and fourth stamens emerge; anthers white, 0.4-0.6 mm long, 0.3-0.7 mm wide, held over and covering pistil; thecae ellipsoid, not divaricate, pollen white. INFRUCTESCENCE with obovoid-ellipsoid, purple berries, ca. 6 mm long, 3-3.5 mm wide; me-socarp gelatinous with linear raphide cells; seeds 2, 2.8-3 mm long, ca. 2 mm wide, with minute appendage at apex, longer appendage at base. Figs. 89 and 93. Anthurium hebetatum is endemic to Panama having been collected principally in Code Province in the vicinity of El Valle and north of El Copé. One sterile collection from Veraguas (Croat 27782) may also be this species. Anthurium hehetatum is found from 200 to 1,200 m in premontane rain forest. The species is placed tentatively in section Belolonchium and is recognized by its coriaceous, oblong-elliptic to oblong-ovate, shallowly lobed leaf blades, its greenish spathe and spadix, its thick intact, but deciduous cataphylls, and by having the epidermis of the cataphylls and petioles cracking and flaking in age. 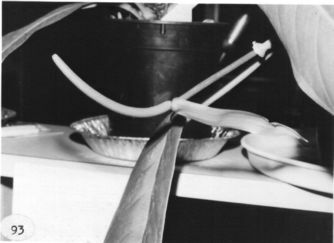 The species is closest to Anthurium cinereopetiolatum, which has similar thick cataphylls, coriaceous leaf blades, a greenish spathe and spadix, and reddish berries. Both species also have grayish cataphylls and petioles. 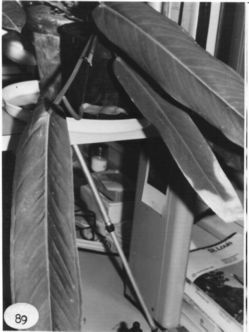 Anthurium hebetatum differs from A. cinereopetiolatum in having broader, oblong-elliptic to oblong-ovate leaf blades. The blades of A. cinereopetiolatum are usually narrowly triangular or ovate-triangular and broadest near the base. In addition, the blade surfaces of A. hebetatum are matte whereas those of A cinereopetiolatum are semiglossy. The name is derived from the Latin "hebetatus" meaning matte. Panama CoclŽ: 775 m, 08.36N 80.07W, 25 March 1993, Thomas B. Croat 74779 (MO). Panama CoclŽ: 785 m, 8.37N 80.08W, 11 July 1987, Thomas B. Croat 67114 (MO). Colombia Choco: 150 m, 5.44N 76.29W, 20 April 1983, Thomas B. Croat 56228 (MO). El Valle behind Club Campestre, Croat 14291 (MO, PMA);N of El Valle, Alien 2204 (F);La Mesa above El Valle, Croat 25323 (MO), 37415 (CM, F, MO, PMA, US), Dwyer 11914 (MO, PMA), Mori et at. 6604 (MO), Nee & Dwyer 9207 (MO), WiVawet at. 15658 (DUKE); road from Llano Grande to CoclŽcito, Hammel 1838, 1861 (MO). veraguas: valley of Río dos Bocas, Croat 27782 (MO).